You are here: Home / Church Talk / church growth / Should Reducing Hate be a Measure of Church Effectiveness? Often we hear of how the church is failing in the NE and NW. Success is often defined in terms of membership, worship attendance, and money. But, what if we used the existence of hate groups as a gauge for ecclesial success? What does it really say about the church, that, in some of the most churched parts of our country, hate groups proliferate? Surely this is a failure of the church. What a great question. But how can we determine if a church can be effective at creating more love and disarming more hate? One way to do this is to examine the data from groups that track such trends. 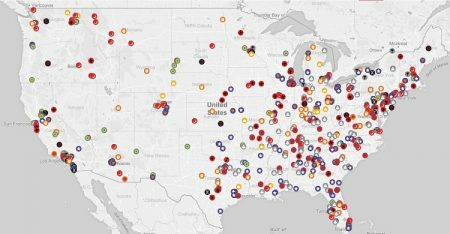 The Southern Poverty Law Center, vanguard of race relations data and advocacy in America, has a Hate Map where they name and track the various hate groups that organized against immigrants, Muslims, and other minorities. 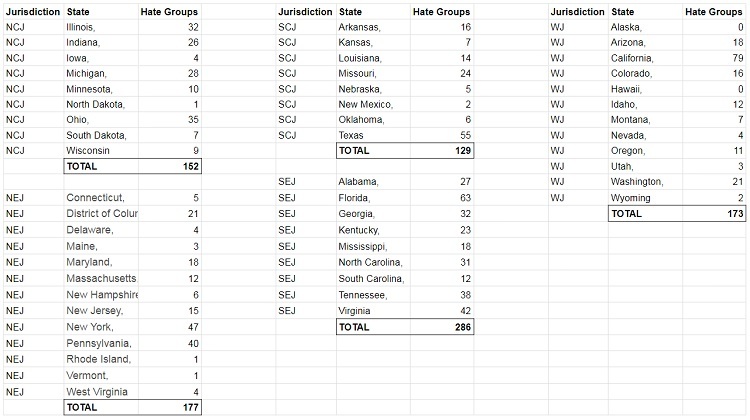 While they cannot track the membership totals of these groups, they know where they are located: there are currently 971 hate groups being tracked, including 160 KKK-affiliated groups. They helpfully allow the map to be broken down into category of hate group and location. You can see a screenshot above, as this tool proved to be incredibly useful. Using my denomination of The United Methodist Church as an example, which helpfully breaks down reporting by region (more or less lining up with state lines), I was able to correlate the Hate Map with the regions in The United Methodist Church in various charts. Here they are. Analysis: The Southeastern Jurisdiction far and away has the most hate groups, which makes sense given its troubled history from the Confederate States to the 1960s race conflicts to today. But I was surprised how many operate in the northeast and west coasts. Here’s the full data breakdown by jurisdiction. Analysis: 5 of the Top 10 come from the South, including always-contentious Texas. Two come from the Rust Belt areas. California and New York as populous progressive states have a dark side–as does Illinois (with most hate groups based in Chicago). Here’s the full data breakdown by jurisdiction. Analysis: While there are six states from the South on this list, far more interesting is the “western flight” of hate groups seeking to carve out their own areas in the northwest has led to Idaho being targeted by hate groups and adding two other northwestern/northcentral low population states to this per capita list. DC, I think, is over-represented because of course national groups would want to be based out of DC. Obviously, the purpose of these charts isn’t to say that Texas is racist. It is, but so is everyone else. Rather, the purpose is to ask: Why is there a correlation between number of churches and number of hate groups? The regions of the country with the most hate groups have the highest number of churches (especially large churches). 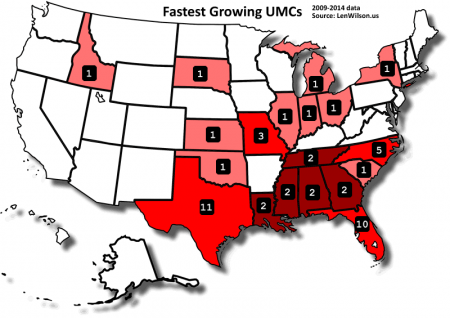 Per the map above, my own denomination of The UMC parallels the national data. The question I really want to ask is if there is a correlation between hate group membership and church attendance. Unfortunately, it is impossible for me to answer that question as hate group membership is not reported so it is unknown whether hate group members actively attend church services, though a disturbing percentage doubtlessly do. So instead, I’ll ask this question: should churches be doing more to combat organized hate in their communities? With so many hate groups spread across the country, why wouldn’t churches want to engage and disrupt their reach, especially the ones in their backyards? No one is immune to these hate groups, and I would think every church would want to stop their proliferation, particularly denominations that can share best practices. How hard is it for churches to engage the hate groups that operate in their backyards? I don’t mean to simply regurgitate statements by national organizations or leaders that condemn white supremacy in all their forms. Everyone from the National Association of Evangelicals to over 25 individual statements by United Methodist Bishops to Russell Moore can be shared. Sharing them is important, but action is needed. I mean to ask what about the local church’s role in all this. What can they possibly do to effect change? It turns out that all it takes is one man’s persistence to lead 200 men away from the KKK. If one man can do that, imagine what a dedicated church could do. Does it matter enough to count it? Want to know what often spurs churches to do something? When they are required to report on it. We value what we count. In our metrics, United Methodist churches send in reports on dollars in the plate, attendance, conversions, baptisms, numbers of people involved in mission, and myriad others. But nowhere are we evaluated on engagement with hate groups, or reduction of hate in our communities. Perhaps we need to. Perhaps we need to report “contact hours” of the church with hate groups or events in our communities. Send 5 people to a two hour demonstration against a KKK rally? That’s 10 contact hours. 20 people surround a mosque to protect it during evening prayer for an hour? 20 contact hours. And conferences can report on the number of multicultural churches in their regions. Because as the story above about Daryl Davis shows, it’s the contact hours and experience that matter. Not the attendance at church (sadly, attendance does not mean one is inoculated against active racism) or the contributions to the Capital Campaign. It’s the contact hours and the intentionally diverse churches that matter. And maybe we need to start counting that. This is personal to me. My state of Washington (I moved to Seattle in July 2017) has 21 hate groups in it, many of which are the violent skinhead gang types that are attracted to urban places. I don’t know them. But the members of the homeless community do, and the homeless community is served by my church’s ministries (overnight shelter and Sunday community breakfast) so the skinheads’ actions impact my community. By engaging hate groups and demonstrations, I’m advocating not for abstract people, but for my own congregation and parish community in downtown Seattle. So answering this question matters to me personally in my ministry context–and I think it does in yours as well. The easy reason I could point toward where your numbers are concerned is population density. Another number I would point to is despite some areas of growing population – even in the South – you have fewer and fewer folks attending church. So not only do you have a case of correlation not equaling causation, but also a lack of data re: population density and diminishing church attendance in growing areas. The brutal truth and reality is that, collectively and often locally, churches in the US have very, very little impact on the culture – positively or negatively. I’m not sure what you’re trying to say Jeremy, but it appears akin to the “statistics cause cancer” saying. As I wrote above, I didn’t indicate a relationship between correlation and causation, and why. What the correlation between church attendance and hate group location indicated to me was a call to activism. While we can lament the declining influence, sitting in sackcloth and ashes is a temporary state and after that, we dust ourselves off and see if there’s a new action that churches that are well located for such work can accomplish. I am on my way home from an “Outcomes” conversation and planning session sponsored by the generous support of the Texas Foundation. The conversation centered on what conference’s need to measure beyond nickles and noses. For the West Ohio team and others this was a topic for consideration. How can reduce the number of persons lured into these anti-Kingdom cohorts. That’s awesome, Doug. Glad your people are already on this genre of thinking. Your use of the Southern Poverty map of hate groups is regrettable in that it continues the proliferation of their dogma about groups that they do not agree with. Just because you do not agree with a groups position on social issues does not correlate that that group is a hate group. But then when you use such a nebulous term as hate any one can be labeled as hateful. No actions or threats are needed for this designation then. Are you actually saying that the KKK and Neo-Nazis aren’t hate groups? They literally exist because they hate black people and Jews. Carolyn, opponents of LGBTQ inclusion routinely oppose any categorization of LGBTQ-opposed groups lest that impact the social acceptance of homosexuality. Therefore they tolerate groups that call all homosexuals pedophiles and that reduce their rights to housing and workplace just so that their practice of LGBTQ exclusion is not named or denigrated. It’s such a baffling place to exist, in my mind. In the absence of quality data to draw direct correlation between the two, I might encourage a sociological or anthropological look at this. On the surface, I’d encourage looking for the similarities between hate groups and churches. Dogma- a set of beliefs that hold us together often with limited evidence that is provided directly to us by those in power as if it is overriding truth. It is really hard to look in the mirror, and as a skeptical, progressive Christian church makes me extremely uncomfortable. I often feel totally out of place and like I’m a sheep hiding in the wolve’s den. My fear of being sniffed out as someone who hates church but goes for the community and the hope that I’ll find another vigilante Jesus follower who sees the empire in the church is overwhelming at times. I’ve sat on this thought overnight and realized that it could be construed as equating church and hate groups. The moral equivalency is not there. I just want to name that. What I was trying to say is this “If both groups are thriving in a specific area of the country, perhaps they have something in common that is attractive to the same subset of people. I’m sorry if my comment was vague or confusing. If the SPLC is your source then your whole post is suffering from a lack of credibility. They designated the Trump campaign as a hate group. And now they have been caught send money off shore. No doubt so they can provide anonymity for their donors. What if the Church is Wrong on Sin? Methodist? Is there an App for That?